In September 2015, the United Nations asked businesses, nonprofits, individuals, and government agencies around the world to collaborate on solving society’s biggest global problems by 2030. Global Goals Week 2018 is the three-year anniversary of that ask. It’s a time to reflect on progress and make a renewed commitment to reaching these goals. Regardless of size or designation, any organization can (and should!) work toward these sustainable development goals, but if you’re a for-profit business or social enterprise your efforts don’t have to operate exclusively from profit! Using a variety of systems thinking and social innovation techniques, organizations can integrate the U.N. SDGs directly into their business models. Let’s briefly explore what the SDGs are and how we can collectively rise to meet them. With an incredibly tight deadline that’s now a mere dozen years away, achieving these goals, or even coming close, will require that all sectors of society—governments, businesses, nonprofits, and the general public—work closely together. Success relies on organizations weaving the goals (and their subsequent targets) into all projects as well as into the organization’s structure, making SDG performance second nature. Seattle-based Evernu partnered with Levi Strauss & Co. to produce the first jeans on the market made from waste cotton that has been converted to renewable fiber. New York state’s Ecovative uses mycelium-based biomimicry techniques (think mushrooms!) to grow a line of positive-impact, organic products that range from packing materials to home furnishings. Portland-based Elephants Delicatessen scaled both impact and revenue, folding values-based decision-making into everything it does and donating over $100,000 in fresh food, diverting 46% of their food waste to agencies that repurpose it. Here in Chicago, social enterprise Bright Endeavors trains and mentors young moms from underserved communities to make soy-based candles, securing quality employment and a path to professional success. While these organizations may not have set out to specifically achieve the U.N. Sustainable Development Goals, their efforts each align with several of the goals. These organizations also go far beyond standard corporate social responsibility and traditional philanthropy to embrace true social innovation where purpose and profit are uniquely aligned to drive the organization forward. Research has shown that these types of purpose-driven organizations are more successful in the long-term. [The problem is] about making every group inside of a company responsible for delivering a single, seamless experience to their customers. While Mr. Kuang’s post is specifically focused on customer experience, because of the far-reaching implications SDGs will have across departments, business units, and supply chains, organizations looking to implement SDG projects will face similar challenges. Corporate Social Responsibility (CSR) efforts within for-profit companies need to evolve from operating as siloed departments with few resources to a general philosophy that is baked into the company’s DNA at every level. These enterprise-wide efforts should be driven by pursuing SDGs alongside and in tandem with profit. Nonprofits, which already have changemaking missions at their core, should operate as social enterprises, identifying self-sufficient ways to generate sustainable income outside of traditional philanthropy, which can be uncertain at best. This will help them better pursue SDGs and remain financially solvent in good or bad times. Both nonprofits and private sector businesses should actively partner with civic organizations to enact legislation required to make SDG-related change happen. Government agencies should make it easier for these organizations to get (and stay) engaged by operating with higher levels of transparency and use digital channels whenever possible to cut down on red tape and alleviate blockers to positive societal change. These are simple descriptions of complex change management processes, of course. Regardless of organizational structure, however, whole systems thinking and social innovation workshops that incorporate the SDGs can help any organization better address these challenges and thrive while doing so. Cross-sector partnerships with organizations that focus on areas where yours is weak can help a great deal as well. As a Certified B Corp, companies like Mightybytes have an advantage in how we meet sustainability goals. 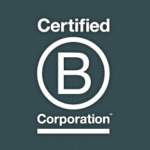 B Corps are hardwired to blend purpose with profit. Sustainability efforts play a big role in how we do that. It’s also one of the ways we create winning customer experiences. Plus, the B Impact Assessment provides a great toolkit for continuously improving upon these goals over time. 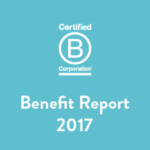 Mightybytes (and all Certified B Corps) use the B Impact Assessment to audit our social and environmental impact every three years. This gives us a flexible roadmap for building a better business that, conveniently, is aligned with the SDGs. We use its principles to guide our decision making on everything from the clients we pursue to how we generate profit and support ongoing philanthropic efforts. Then we do what our resources can support over time. By paying all our employees a living wage and offering the best benefits that we can afford, Mightybytes addresses SDGs 1 (no poverty), 2 (zero hunger), 3 (good health and well-being), 8 (decent work and economic growth), 10 (reduced inequalities), and 11 (sustainable cities and communities). By powering the websites we build with renewable energy and offsetting our Chicago-based company’s greenhouse gas emissions, we support SDGs 7 (affordable and clean energy), 11 (sustainable cities and communities), 12 (responsible consumption and production) and 13 (climate action). By joining 1% for the Planet and committing 1% of our top-line revenue to environmental nonprofits, we support SDGs 6 (clean water and sanitation), 7 (affordable clean energy), 11 (sustainable cities and communities), 12 (responsible consumption and production), 13 (climate action), 14 (life below water), and 15 (life on land). Our 1% membership also helps us foster productive partnerships with member nonprofits, which supports SDG 17 (creating strategic SDG partnerships). Some of these partnerships in turn provide business referrals for us, helping the company generate sustainable profit. They also inform our efforts to create great customer experiences that have value beyond simply financial-based transactions. Mightybytes is LGBTQ-owned and the majority of our company advisory committee is comprised of women, which supports SDGs 5 (gender equality) and 10 (reduced inequalities). We are actively pursuing more cultural diversity in our staffing as well. Many of our clients are in the education sector, which supports SDGs 4 (quality education) and, longer term, 8 (decent work and economic growth). Finally, by helping values-aligned, mission-driven organizations find success, we support the majority of SDGs in some way. In 2016, 70% of our client base was comprised of nonprofits, community foundations, and mission-aligned businesses, such as other B Corps. That number rose to 81% in 2017. We know there’s room for improvement on all of the sustainable development goals, but this is a start. In terms of social innovation, while we offer a green hosting package and create efficient, user-friendly digital products and services, there are no doubt many more ways Mightybytes could drive income while also fulfilling our mission to benefit society. How we track all these goals over time could use some improvement as well. The B Impact Assessment is aligned with U.N. SDGs. However, it contains no tools to specifically show your SDG progress over time. That would be helpful. Sustainability management tools like FigBytes have U.N. SDGs built right into their software. For many, using sustainable development goals as a business framework can be a new way of thinking about how to run an organization. Purpose and profit are no longer mutually exclusive but rather interwoven with the fabric of how a company or nonprofit operates. 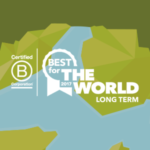 You don’t have to become a Certified B Corp to create positive societal impact (though we think it certainly couldn’t hurt). We encourage organizations of any size or type to join us in working toward the U.N. Sustainable Development Goals. The clock is ticking. People and planet notwithstanding, your organization will be all the better for it! Does your organization struggle with how to best align purpose and profit? Do you want to make better progress toward the U.N. Sustainable Development Goals? We’re collaborating with cross-sector community partners on a social innovation workshop to address these issues and more. Our goal is to launch the workshop in Q1 2019. If you’re interested, drop us a note below and be the first to hear about it.